Germany’s banking market is crowded with 1,580 banks grouped into three “pillars” of private, public and co-operative. The public contains 385 Sparkassen (savings banks) and 6 Landesbanken (clearers for Sparkassen). The 875 co-ops have Germany’s second largest DZ Bank, as their clearer. German banks’ average ROE was 1% in 2016, although DiBa (ING’s online version) managed double digit returns. Deutsche Bank only started adapting to the financial crisis of 2007-2008 in 2015 and in 2018 its ROE was 0.4%. Commerzbank’s was 3%. The German govt would like them to merge, although they have limited say as they only hold 15% of Commerzbank and none of Deutsche. A merger would mean they could cut retail costs and the two together hold 20% of total deposits; also Commerzbank mainly covers the Mittelstand (private export-oriented firms) and Deutschebank concentrates on bigger companies. However Deutsche is still tying two systems together with Postbank, meaning Commerz would be a third and both banks are slashing costs now in any case. Germany’s banking industry needs to consolidate faster. Will the ECB be forced to cut rates? They have been patiently waiting for inflation to rise. It hasn’t. Core inflation has hovered around 1% since 2015 and that’s despite robust economic growth in 2017 and 2018. Now that growth is slowing there is a concern inflation will too. 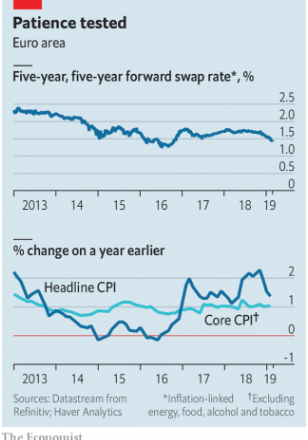 See chart below for the medium term inflation-linked swap rate, the ECB’s favoured guide to market expectations of inflation. They have committed to keeping rates on hold through the summer but they might have to push this out. Taiwan was the first in 1951. Worldwide value-added taxes are 20-35% of government revenue but as much as a third of this may be lost through under-reporting. If customers receive receipts with a code that enters into a central prize draw then sales will be recorded and not go unreported by the retailer. Slovakia has had a scheme since 2013 but thinks it only added EUR8mio to VAT receipts. São Paulo is so sure its receipt lottery increases tax collection, not only do they enter the draw but they receive a 30% rebate of the sales tax paid. With unemployment at its lowest level in decades, inflation close to target and interest rates globally close to zero, now seems a good time to see if the Fed’s policy toolkit can be expanded. There is concern come the next downturn there will be no room to act with monetary policy. Average inflation targeting is one route. where the 2% target is spread out over time. This means that overshooting is only compensating for undershooting, but people have to believe the Fed can and will do this. Elon Musk has made claims via Twitter that saw him fined and confused investors, but there are alternative data sources. Quandl, a data provider, receives data from insurance companies that tell it how many insurance policies are being taken out on Tesla cars so it can work out how many are on the roads. Bloomberg tracks Vehicle Indentification numbers (VINS) so it can tell how many Tesla are registered. Evidence Lab took apart a Tesla Model 3, Chevy Bolt and BMW i3 to find out how much each vehicle cost to make, thereby calculating when companies become profitable. Tesla’s build quality was poor yet costs were high. No big reforms of the labour market, no scrapping of the employment guarantee scheme or identity scheme, but he did implement the nationwide value-added tax that was previously proposed by Congress. Continuity persisted despite Modi’s party winning a rare majority in parliament. His power is checked by the upper house, courts, public auditors and the states. He did cut red tape (India has risen 65 places in the World Bank’s ranking of ease of doing business). He removed fuel subsidies helping to beat inflation and reduced corruption. His most innovative decision was his worst, cancellation of high value bank notes. The government was surprised when most of the notes were redeemed. It seemed to do little harm to the economy but this is hard to know as the government has since discontinued and delayed official data which did not flatter it. It started around the time Trump raised tariffs on washing machines as the govt ratcheted up its trade war with China, but there’s more to it than that. The downturn looks like 2015, which was partly due to the bust that followed the shale boom. China was also a large factor then, as they reined back credit following the financial crisis and tried to implement measures to open their financial markets, which were premature and resulted in money fleeing the country and stock prices crashing. The taps were then turned back on. The “augmented” budget deficit (i.e. the real budget deficit when taking govt’s special purpose lending vehicles etc into account) rose to an estimated 15% of GDP. This was then turned down again. China should not matter so much given its tight capital controls make financial links with the rest of the world modest, but the world has grown to rely on them too much. With rates at or below zero there’s not much room to manoeuvre. China has turned on the taps again. The Brexit division is deep and unresolved. 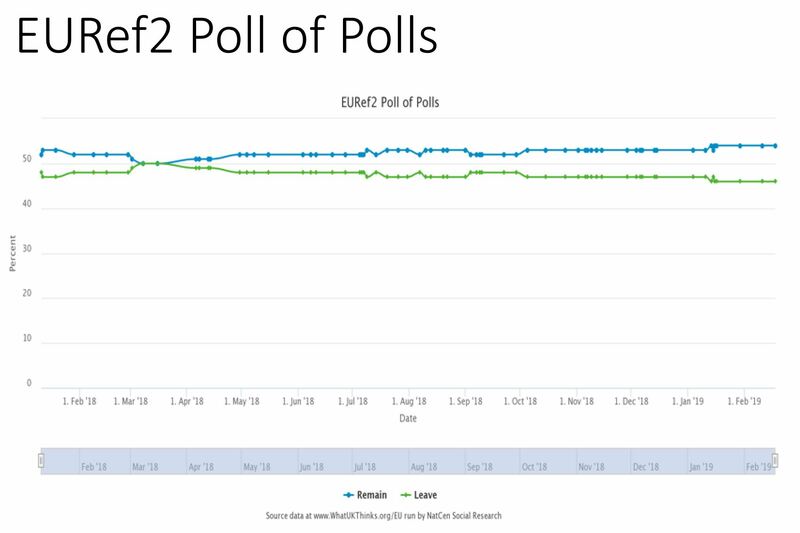 Polling on a second vote suggests the wording is key: if it’s a People’s Vote it yields more support than if it’s a 2nd Ref. “You cannot unambiguously say there is clear support for a Second Referendum“. 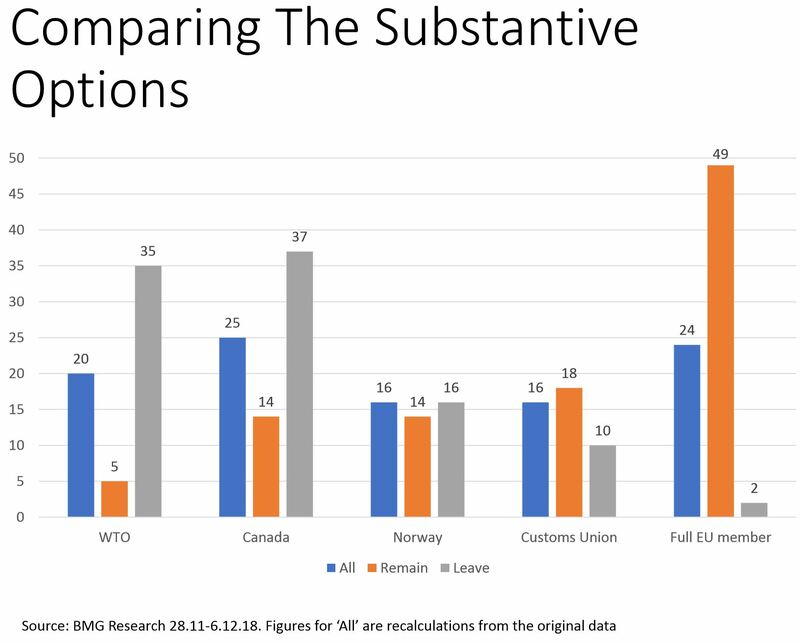 Opinion has shifted against Brexit, but the “Remain lead rests heavily on whether those who did not vote would turn up to vote this time“. “Loyalty of Leave voters has declined to a degree“. 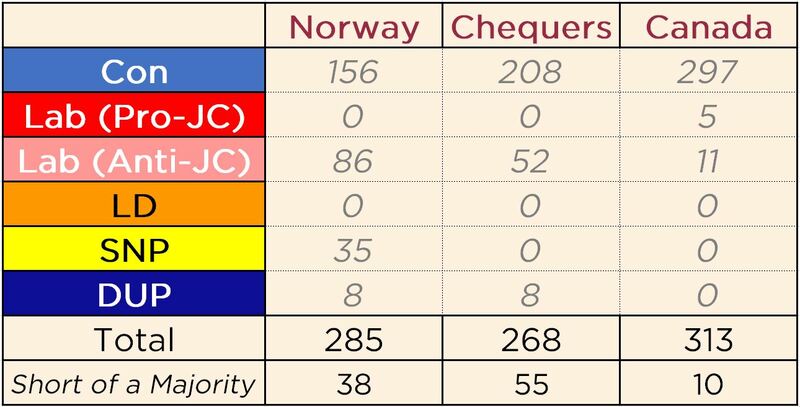 TIG is similar to SDP in that it arose from division over Europe, and it will likely have to form an alliance with the Lib Dems to gain enough ground to matter. If they can get >35 MPs then they will become the 3rd largest party which will award them privileges over parliamentary time. An early General Election would be “disastrous” for TIG but they might do well in the European Parliamentary election as the anti-Farage Brexit Party, should the UK have a vote in those elections. Few expect Brexit to be wrapped up by 29th March. All the legislation will be held up by the House of Lords anyway. At what point do MPs start to panic? Expectations are already being trailed that a loss of over 100 would be enough to make her go. – We would disagree. 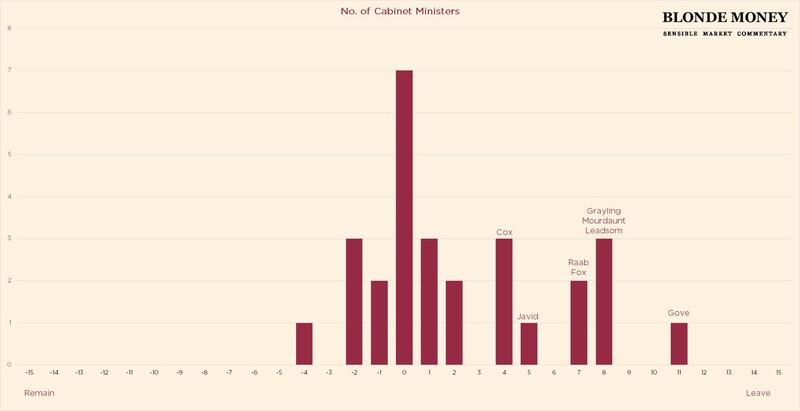 Any woman witnessing Thatcher’s enforced departure would not leave the top job unless the numbers make it so. Even the most extreme Brexiteers and Remainers fear they don’t have enough momentum to carry half of the party with them. That’s why they couldn’t move until TM was knocked out onto the canvas. They had to be certain she was gone. But even now, Conservative MPs face a dilemma. – Once TM goes, one of the final candidates won’t be Brexity enough for Brexiteers or Remainy enough for Remainers. That means both factions have a 50% chance of losing out. The odds however favour the Brexiteers. The final decision on leader comes down to the Conservative Party membership, and they’re certainly on the harder Brexit side of things. In trying to move the odds in their favour, it’s no surprise that neither Brexiteer nor Remainer can yet agree on who their own candidate should be. Are you confident that if TM goes, you’ll get someone you prefer in her place? For Brexiteers, the answer is probably Yes. 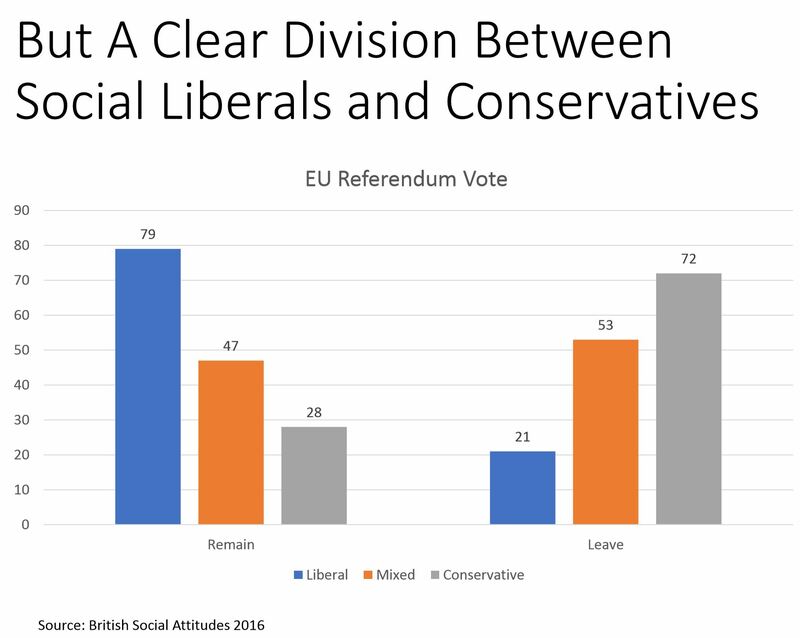 For Remainers, it’s less clear cut. So how many Tory MPs are Remainers? One third of the Party ranks at a zero or below. This is the Remainer rump. And where can Theresa May find her magical 158 MPs? Everyone ranking at +2 or below would get her there. Can Javid, at +5, become a kind of compromise candidate? Likes Leave enough to please the membership but Remain enough to calm his Remainer colleagues? He won’t get the chance if 158 MPs decide they prefer the devil they know. So this contest will only be called when it has the momentum the Prime Minister’s detractors desire. It might be tomorrow. If it’s not, it is still coming. The end game of power, and the chance to shape the Brexit of your dreams, are within your grasp. It’s just a question of timing. And while it lurks, the Labour Party can continue to hold fire on their own No Confidence vote, despite Vince Cable and Nicola Sturgeon publicly lambasting Jeremy Corbyn for not doing so already. 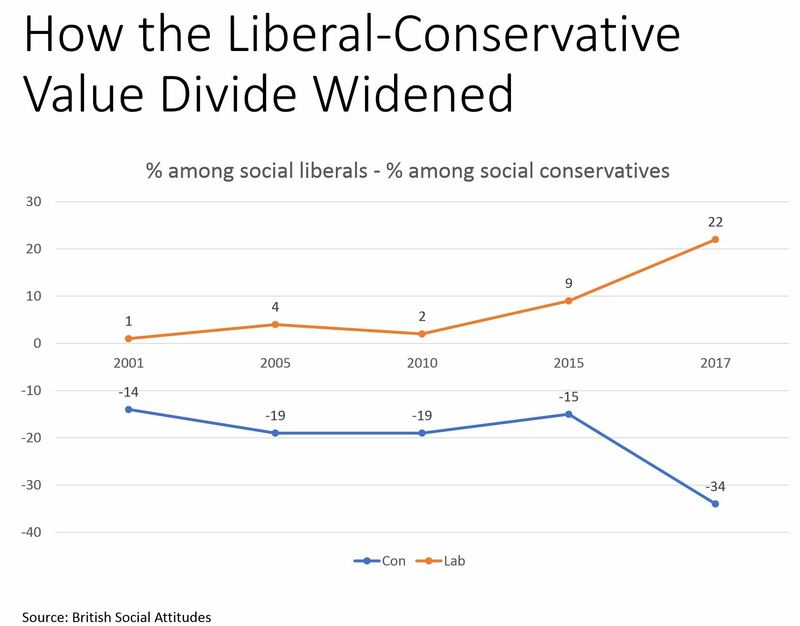 Why pull the trigger if the Conservative Party can set off some friendly fire shots that weaken their already divided party? Even if TM wins, she won’t be out of the woods. The pressure cooker will still be steaming. Every attempt to try to preserve the status quo is tinder for the fire for those who desire a very different Brexit outcome. The upshot for financial markets is that we are entering a much more significant crisis period. 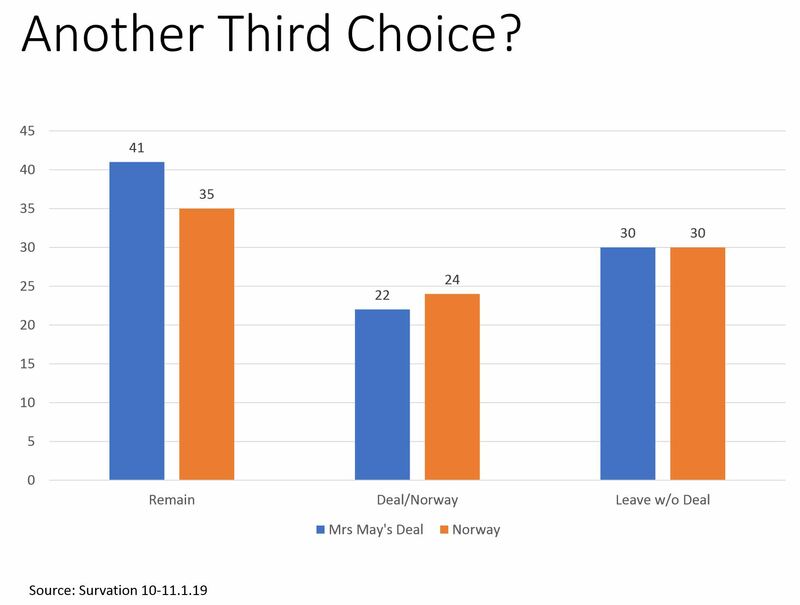 The chances of either No Deal or No Brexit are rising. All these months of inaction were not a reason to be calm about the future. They were merely time for some shadow boxing and weapons stockpiling before the bombs start to go off. We continue to expect a sharp dislocation in GBP assets in the next couple of weeks as this becomes apparent. 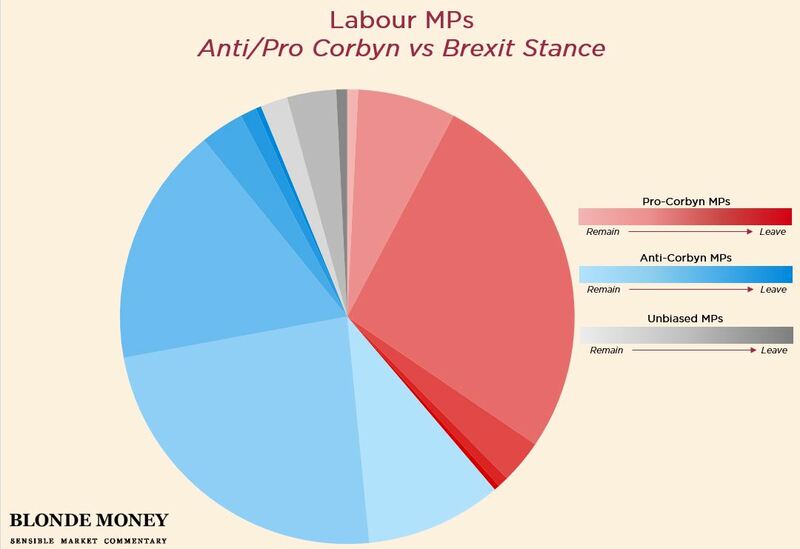 Which Labour MPs will vote Conservative? Attention has moved from the 40-80 Conservative MPs that Steve Baker claims can kill the government, to the 30-40 Labour MPs that Downing Street hope can let its deal survive. The Times and the FT both run stories today on these so-called Labour rebels. If you would like more detail on how we calculated these figures, or to run other configurations, please let us know.